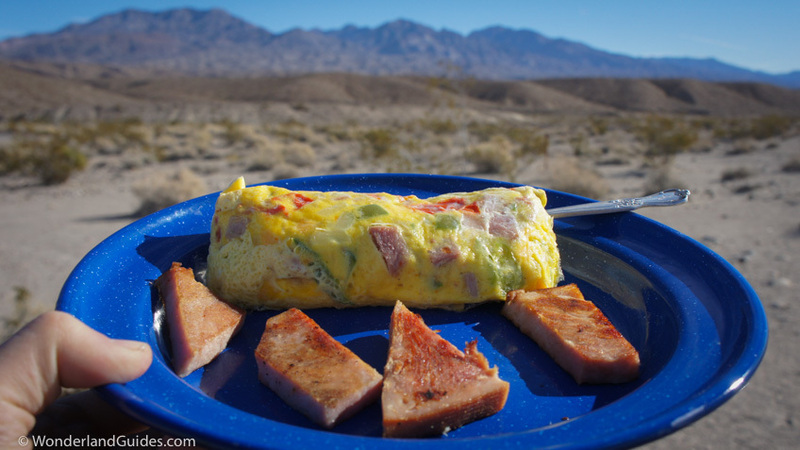 A great camping meal that is easily customized and super easy for feeding a group of campers. 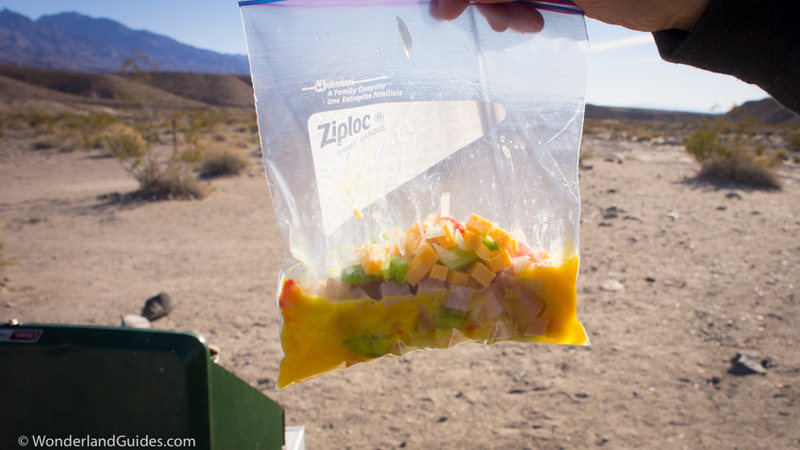 You can also use dried ingredients to make this into a low-mess backpacking meal. 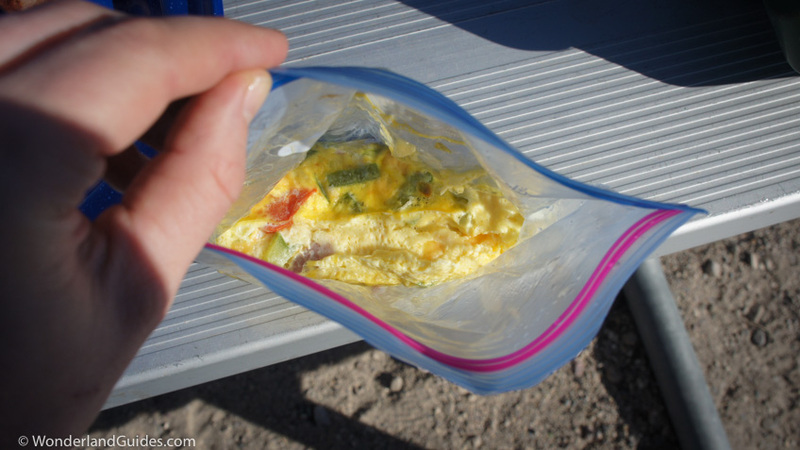 Omelets made in a bag are at the top of my list for great camping meals. This is a versatile breakfast, and once you get the idea down, you can adapt the recipe for many tastes. 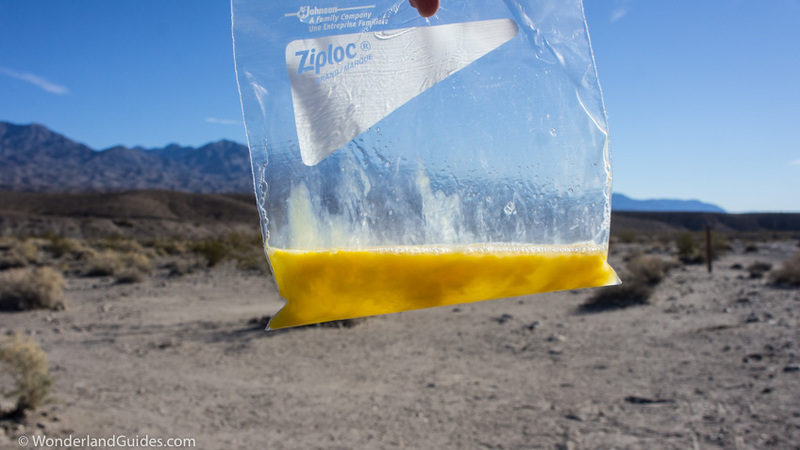 For those of us who sometimes want a good breakfast far from the car, you can use dehydrated or freeze-dried ingredients and powdered eggs to turn this into an excellent backpacking meal. This is a wonderful camping breakfast to feed a group of people. Some folks might consider this a bit labor intensive for only one or two servings, but the prep is totally worth it if you’ve got a few extra bellies to fill and a couple picky eaters in the mix. It can take a lot of work to prepare a meal for a group of people, but this recipe is one of the easiest and most rewarding group meals I've tried. 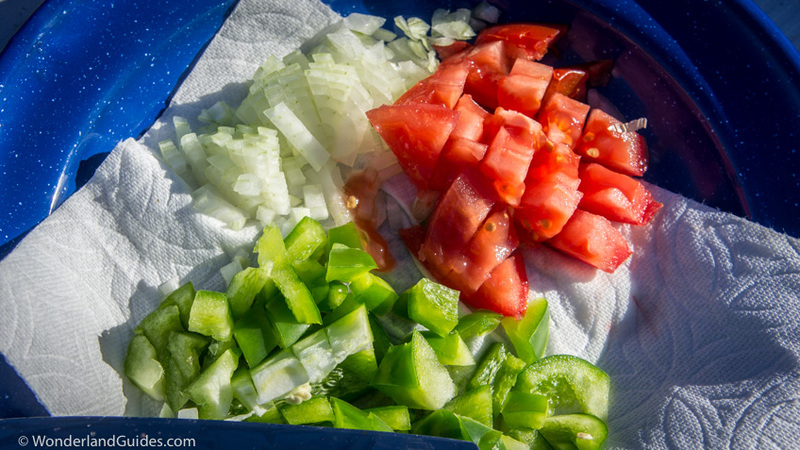 Tip: You can make this simpler to make in camp by chopping the ingredients at home and storing them in plastic bags in your cooler. Just make sure the ingredients stay cold and try to use them within a couple days. 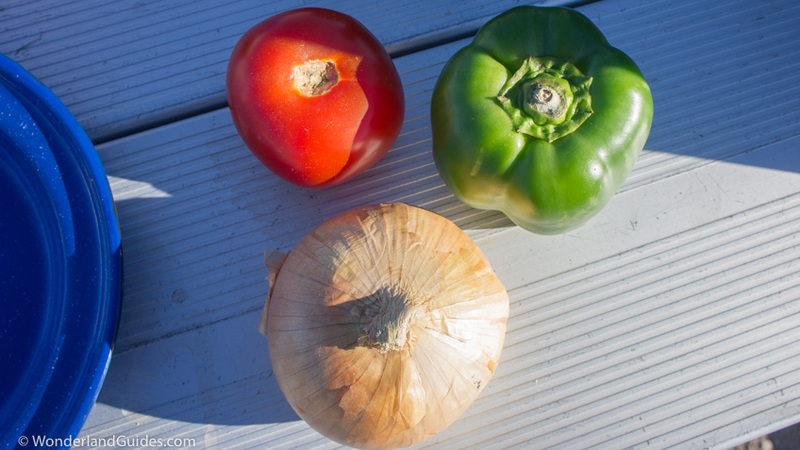 I like things fresh as possible, so I prefer to bring whole vegetables with me camping. Easy to clean up (each omelet is made in a freezer bag). You can make many servings at once, and serve everyone at the same time. Really dang hard to mess up (unlike traditional omelets). Each person can customize their own omelet (great for your picky eaters). Depending on the ingredients you choose, this can be a low-fat meal or a big wallop of protein and fat to power you through a tough day of outdoor activities. If you’re backpacking with a stove, this can be made into a backpacking meal by dehydrating your ingredients beforehand or by purchasing freeze dried veggies. Mountain House makes some decent freeze-dried veggies (Amazon) and you can use this with powdered eggs (Amazon) to make a super easy, lightweight and filling backpacking breakfast. Instead of ham and cheese which will spoil outside of the fridge, go with dried bacon bits and a little shelf-stable grated parmesan cheese. If you're using dried vegetables, give them a little soak in tepid water to give them a chance to rehydrate before adding them to the eggs. While you’re prepping your ingredients, fill a large pot almost to the top with water, cover with a lid and crank the heat to high. Wash your selection of vegetables. Lots of different veggies will work great in this recipe. Choose your favorites and chop the ingredients small so that they cook through by the time the eggs are finished. Dice the vegetables. If you forget your cutting board like yours truly, placing a paper towel on a plate can improve the cutting surface. 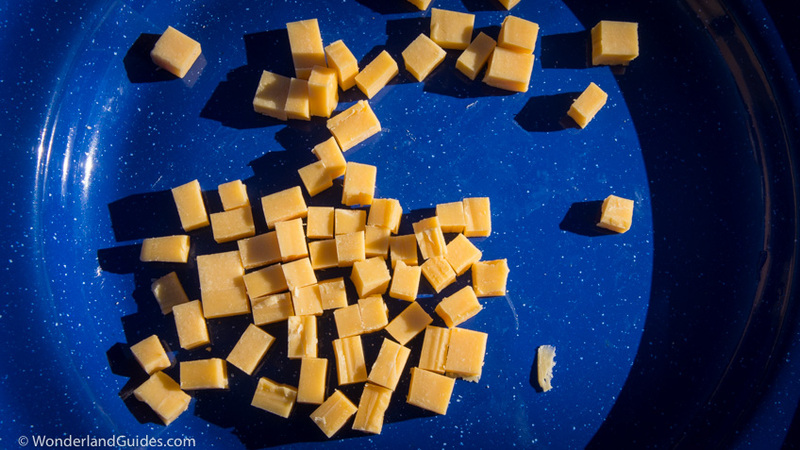 Shred the cheese (or dice it if you’re lazy). 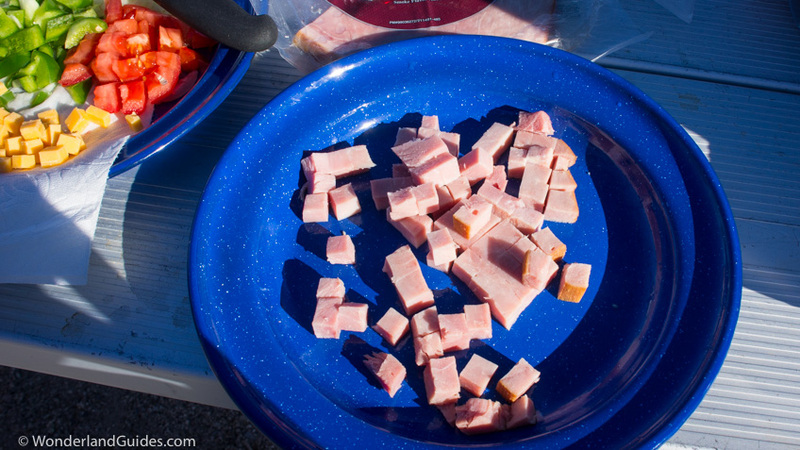 Chop the ham steak into cubes. At this point I like to lay out the fillings buffet style and hand out 1-quart freezer bags so everyone can assemble their own omelet. For each omelet, crack two eggs (or three if you're a hungry hungry hippo) into an individual bag. 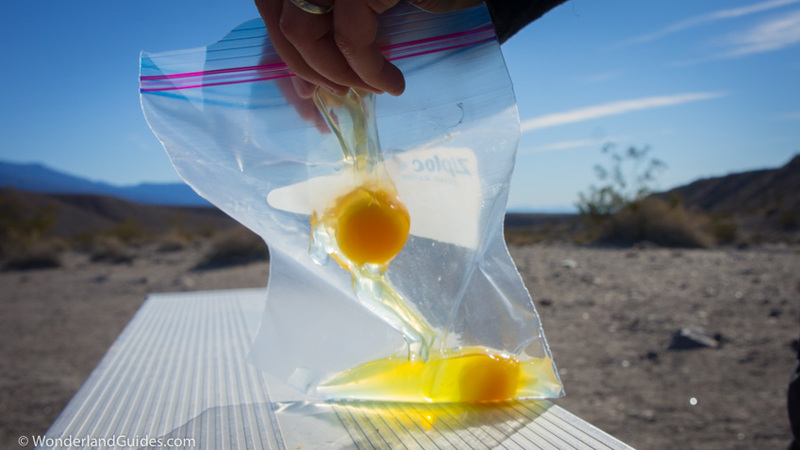 Squeeze the bag and squish the eggs back and forth to beat them. Once the eggs are beaten add all the ingredients you want in your omelet. Squish the eggs and ingredients around in the bag so things get evenly distributed. Here is the only tricky step! You need to get as much air as possible out of the bag. Otherwise your omelet will not cook evenly and it will take much longer. I find that carefully rolling the bag up toward the top zipper, pushing out all the air works well. Once you’ve got as much air as possible out of the bag, seal the zipper tightly. Your pot of water should be at a high simmer now. Carefully lower each omelet into the pot, making sure the omelet mixture is fully submerged in the water. You don’t need the water to be boiling to cook the eggs. Once you’ve added the bags to the water, turn down the heat to low so as to maintain the temperature at a low to medium simmer. I like to keep the water temperature a little lower than boiling. Why? Most freezer bags are made of polyethylene. Polyethylene melts between 115-135 °C and water boils at 100 °C at sea level. In case you're curious, most freezer bags are free from phthalates and BPA -- chemicals known to cause cancer by mimicking estrogens. Polyethylene is very inert and the FDA says its safe. There's some controversy on the subject though. To be on the conservative side, I like keep the cooking temperatures a little further back from polyethylene's melting point by keeping the water temperature to just below a boil. If you use an aluminum pan, the upper edge of the pot and the lid may be cool enough to touch. If the pan and lid are not too hot, I like to keep the zipper end of the bag out of the water and hold it in place by pinning it between the side of the pot and the lid. Do make sure your pot and lid are not hot enough to melt the plastic bag before you do this! Your omelet will be ready in about 12 to 20 minutes depending on how many eggs and ingredients you use as well as the temperature of the water. It will take a bit longer at higher elevations. My example was ready after 15 minutes in the pot at just below boiling temperature. 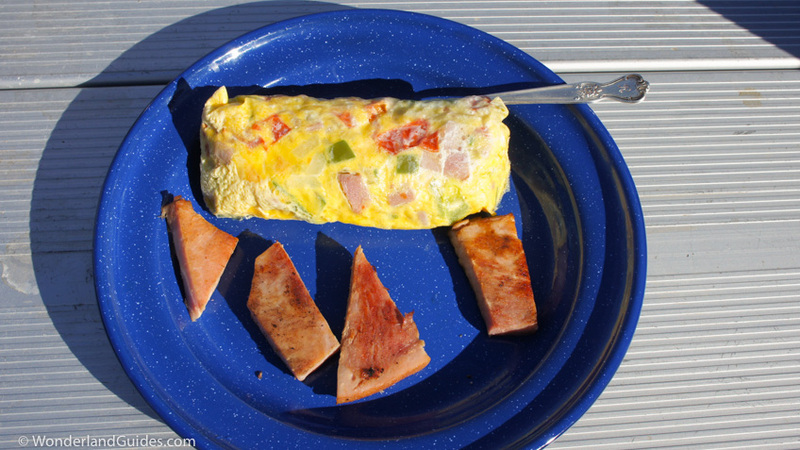 You can eat the omelet straight from the bag like an animal or you can roll it out onto a plate. Optional: Add a dab of butter or a drizzle of olive oil before serving. Check the omelet after 15 minutes and give it a few extra minutes if the eggs are still gooey.